In image manipulation applications, masks are used as means of selecting intricate -- or simple -- areas of an image. Masks can be either solid black and white or they can be grayscale. In Photoshop, the white area of a mask is the area which will be selected, although there is always an option to inverse the selection. Along with Paths, above, Mountain High Maps masks also come into their own when used with Photoshop's "Alpha Channels" -- a powerful method of storing any number of masks within a single image. Using masks you can create a wide range of effects such as shadows and vignetted edges, apply maps to any bitmapped image such as a photograph to create a montage, and most importantly, use the masks with Mountain High Maps relief images to create dramatic, highly effective, and professional maps. The masks are provided at both 300 pixels per inch (ppi) and 72ppi resolutions, and are exactly the same size as their corresponding relief maps. Ocean mask (PC: M) -- a mask for making distinctions between land and sea areas. Borders (D) -- country borders represented by a three-pixel wide line. Borders plus ocean (E) -- country borders combined with the corresponding ocean mask. Coastline (C) -- coastlines and inland waters represented by a two-pixel wide line. Rivers (R) -- represented by a two-pixel line. Graticules (G) -- lines of latitude and longitude represented by a two-pixel wide line. City locations (L) -- dots for locating major cities and towns. These correspond with the city names in the FreeHand and Illustrator files. Country masks -- each country on the map is represented by its own mask, and you will find these in a separate folder/sub-directory. Shadow mask (X) -- a mask for placing an offset shadow behind land areas. Vignette mask (V) -- a mask for creating a soft edge around land areas. Cloud mask for the world maps 6.04 and 6.05. 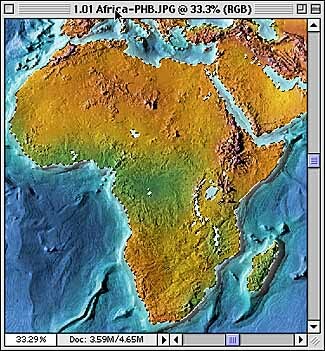 This mask can be used effectively with the relief maps when they are "wrapped" around a sphere (using a Photoshop Plug-in or 3-D software) to create a globe. Open the base version of the map you wish to work on (you may wish to use a low resolution version for purposes of experimenting, since this will provide faster results). Open the corresponding ocean mask for the map. If you are working on the TIFF version of the mask, select "Grayscale" from the Mode menu. Enter a value of "1" in the Size Ratio box in the dialog which follows, and click "OK" (if you are working on low resolution version of the mask, you can skip this step, because these are already grayscale). Choose "Load Selection" from the "Select" menu. In the dialog box which opens, the "Source" pop-up menu will show the name of the map you are working on, while the "Channel" pop-up menu will display the mask you have just opened. If you have more than one mask open from the same map, their names will also appear in the menu--but only if you have already changed their mode to grayscale. Click "OK." The coastline will now appear on the map as "marching ants." This indicates the selected area. Use the "Load Selection" command to turn masks into selected areas. If you already have a selection active, you can add to, subtract from, or intersect with that selection. You can then save the resulting selection a another Alpha Channel. That's it! Any action you now take will apply only to the selected portion of the map. To get an instant result, select "Adjust > Brightness/Contrast..." from the Image menu, and, with "Preview" checked, move the sliders. The masks and Paths supplied with Mountain High Maps enable you to make highly accurate selections, but if you intend cropping or resizing your map, be sure to load the masks or Paths that you'll need into your document before hand. Although we have provided the grayscale relief maps with the oceans already masked as white, you will find that you will have more flexibility and creative opportunities by using the base version in conjunction with its corresponding paths or masks. The most effective way of doing this is to make use of Photoshop's "Alpha Channels" feature. This takes a little getting used to, but it is well worth spending the time learning--and it doesn't take long. The concept is really quite simple; each base color of an image has a separate channel -- RGB images have three channels (one each for the three video colors of red, green, and blue), plus one extra to show the combined colors, whereas CMYK images have four channels (one each for the four process colors), plus one showing them combined. Grayscale images only have one channel. Open the base version of a map (you may wish to use a low resolution version for purposes of experimenting, since this will provide faster results). Open the "Channels" floating palette by selecting "Show Channels" from the "Window" menu. Click on the right-pointing arrow at top right of the Channels palette and select "New Channel." In the dialog box which appears, name the channel "Ocean mask" and click "OK" (leave the other settings as they are). The map image window will now go blank, this being an "empty" new channel. Open the corresponding mask for the map you are using, and choose "All" from the "Select" menu. Holding the mouse button down, drag the mask either from its document window onto the window of the channel you just created, or drag it directly from the "Channels" palette onto the document (if you use the latter method you do not need to create a channel first--dragging the source channel onto the document automatically creates a new channel). Choose "Copy" from the "Edit" menu, and close the mask window. The base map window showing the blank channel should now be active (if not, just click anywhere within it). Choose "Paste" from the "Edit" menu. This will paste the map mask into the blank channel. Whichever method you use (steps 5 or 6), the result is the same, except that the latter uses more memory. Click on the word "Black" on the Channels palette (or hit "Command-1" (Mac) or "Ctrl+1" (PC) on the keyboard"). This will display the base map channel. Choose "Load Selection" from the "Select" menu. In the dialog box which appears, check the "Invert" button and click "OK." The coastline will appear as "marching ants." This indicates the selected area. Choose "Adjust > Brightness / Contrast..." from the "Image" menu. In the dialog box that opens, move the slider triangle on the Brightness bar until "+95" is displayed in the value box. The grayscale relief maps in the Mountain High Maps collection have been engineered to use the fullest range of gray levels that PostScript can achieve--256. This provides you with the greatest flexibility for customizing the maps. However, you may find that using the maps as they come, straight off the disc (right), makes it difficult to read any information such as text annotations, so you may have to alter the contrast of the relief maps. 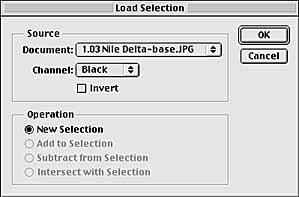 Photoshop provides many methods for adjusting contrast, but the most flexible is the "Levels" control ("Image > Adjust" menu), and a few examples of various settings are shown below. The technique of using a selection channel can be employed for a large number of effects. If, for example, after step 8 above, you pressed the delete key, you would delete the selected area to reveal the background color, ending up with a white ocean (white is the default color for the background)--the same effect as already supplied on your sample map (as the "masked" version). However, if you hold down the "Option" or "Alt" key while hitting "delete," the sea will fill with the foreground color. You can fill the ocean area with a gray tint by defining a tint of black. Do this by opening the "Picker" palette and using the slider triangle on the "K" bar until it displays the desired percentage.